Dipteryx alata is a Neotropical tree widely distributed throughout the Brazilian Cerrado biome and is popularly known as baru. In this study, we evaluated the mating system of D. alata and compared pollen dispersal patterns between the in situ and ex situ conditions. For this, we used 515 genotypes of adults, juveniles, and progeny from a natural population (in situ) in Orizona-GO, Brazil. In addition, we used 488 genotypes of adults and progeny from a germplasm collection (ex situ) located at the Federal University of Goiás. Both locations are situated in central Brazil. The genetic diversity, cross-pollination rates, and pollen dispersal distance under both conditions were estimated. Genetic diversity and polymorphism differed between the in situ and ex situ conditions. The average number of alleles found in situ (5.2) and ex situ (6.2) showed that the germplasm collection stores greater genetic diversity than the in situ condition. 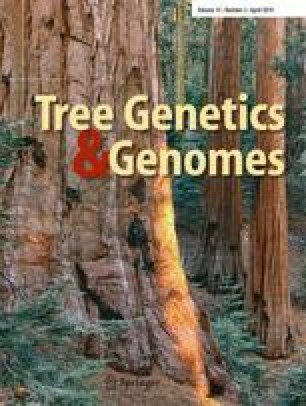 Cross-pollination detected among mother trees under both the in situ and ex situ conditions were high (tm = 0.815 and tm = 0.934, respectively), indicating that the species has a mixed reproductive system that was predominantly allogamous. The difference between tm and ts indicated that the in situ condition shows greater biparental inbreeding. Our results showed that, across generations, the ex situ condition preserved a larger number of alleles, confirming that the D. alata germplasm collection plays a role in conserving genetic diversity. The presence of self-fertilization suggests self-compatibility. Paternity correlation and the dispersal distance of the pollen donors were higher in the in situ condition, a maximum distance of 2.9 km of pollen flow. This can be explained by the number of pollinators and tree spatial distribution. The online version of this article ( https://doi.org/10.1007/s11295-019-1337-6) contains supplementary material, which is available to authorized users. Our research has been continuously supported by several grants and fellowships to the research network Núcleo de excelência em recursos genéticos vegetais do Cerrado (CERGEN) (PRONEX/FAPEG/CNPq, Proc. 201210267000802) and “Chamada pública 08/2014 Capes/FAPEG. Work by R. A. Guimarães and K. M. Corrêa was supported by a fellowship from CAPES, and work by M. P. C. Telles, L. J. Chaves, and T. N. Soares were also supported by productivity grants from CNPq. Current research is developed in the context of National Institutes for Science and Technology (INCT) in Ecology, Evolution and Biodiversity Conservation, supported by MCTIC/CNpq (proc. 465610/2014-5) and FAPEG.